Our school meals are cooked fresh on site by Chef Ola and her team, we use locally sourced ingredients when available and in season. There is always a vegetarian option and a salad selection available each day. Universal Free School Meals are available to pupils up to the end of Year 2. 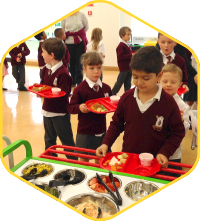 For school meals from Year 3 onwards pupils payment must be made in advance via ParentPay (link below). Our meals cost £2.20 per pupil per day. Are you claiming your free school meal? If your child would prefer to bring a packed lunch from home, we have some guidelines to follow to ensure they eat a healthy lunch.